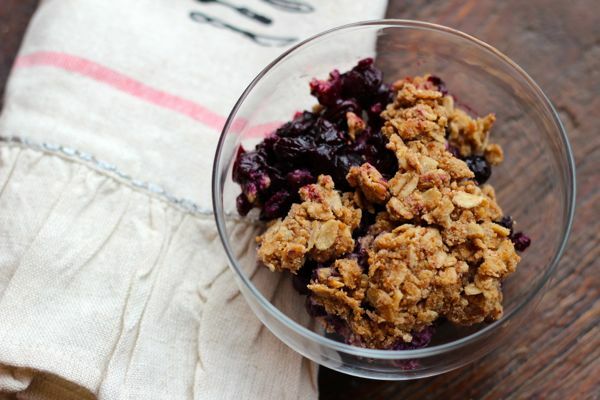 A healthy oat based crisp that showcases the bountiful blueberry. One of my favorite ways to showcase summer berries is in a crisp. Crisps are easy to throw together and the end product is simply delicious. Traditional fruit crisps use butter and quite a bit of sugar with some recipes using more than 1 cup of sugar and up to a half-pound of butter. The extra fat and sugar is simply not needed, berries are already naturally sweet especially when baked. Coconut sugar is used in this recipe as I like trying out different sweeteners. It is simply an unrefined alternative to sugar and contains minor amounts of nutrients but as with all concentrated sweeteners, coconut sugar should be minimally consumed. Coconut sugar has a light and caramelized flavor and therefore works in baked products like crisps or crumbles. This recipe highlights the blueberry taste and provides some healthy texture with the oats and oats flour. This will not yield a decadent rich crisp but rather a simple one and is enjoyed by our whole family. I have been known to have it for breakfast as well. A dollop of Greek yogurt on top of warm leftover blueberry crisp yields a delicious breakfast option! Blueberries are leaders in antioxidant activity as well as dynamos of dietary fiber. They are packed with vitamin C and manganese. Coconut sugar is an unrefined alternative to refined sugar. Oats are just plain awesome. They have an impressive nutrition profile and are high in fiber. Toppings: Greek yogurt, vanilla frozen yogurt, ice cream. Lightly spray a 9-inch pie dish. In a small bowl combine the blueberries, honey, cinnamon and 1/2 teaspoon of nutmeg. Pour the berries in the pie dish. In another bowl combine the oats. Oat flour, cinnamon, remaining nutmeg, coconut sugar and salt. Mix well and add the coconut oil using your fingers to incorporate the oil into the mix. You should end up with coarse, crumbly mixture. 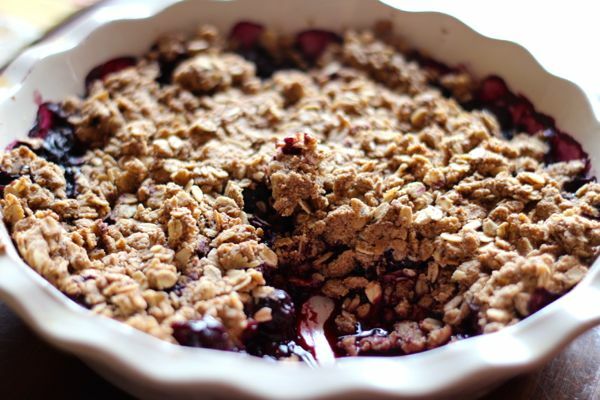 Sprinkle the oat mixture over the berries and bake for 30 minutes or until the blueberries are bubbling underneath.